It took four long days of play, but the 2014 World Series of Poker Event #15: $3,000 Six-Handed No-Limit Hold’em finally has a winner. 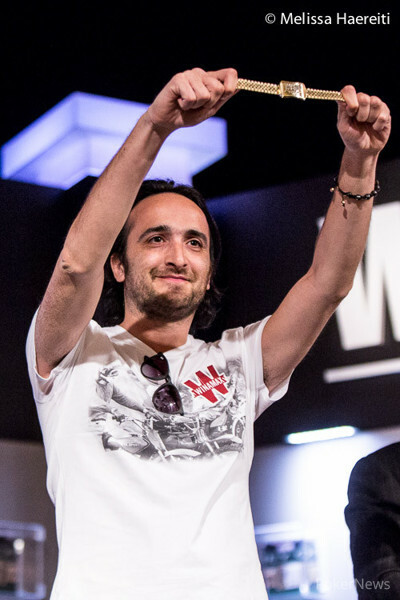 Davidi Kitai, the first-ever braclet winner from Belgium, defeated Gordon Vayo in heads-up play today to capture his third gold bracelet and $508,640 in prize money. The tournament originally began with 810 players, but today just Kitai and Vayo returned after their heads-up match was paused on Day 3. All told the two played 109 hands of heads-up poker, during which time the lead changed on more than one occasion. Last night Kitai began heads-up play with a 5.84 million to 1.45 million lead, but over the course of 40 hands Vayo pulled out in front. When they return for Day 4, Vayo was slightly ahead with 3.75 million to Kitai’s 3.545 million. Even so, the Belgian got to work early whittling down Vayo. Eventually Kitai reclaimed the lead he held when heads-up play began, but Vayo didn’t go down without a fight. First he doubled with pocket aces against Kitai’s , despite the latter flopping a big sweat. Then Vayo got lucky to double with the against Kitai’s in an all-in preflop situation. However, both of those doubles just delayed the inevitable as Vayo would only drop back down. Eventually Vayo got it all in holding the and was dominated by the of Kitai. The board ran out clean, and Vayo had to settle for second place and a $314,535 consolation prize. 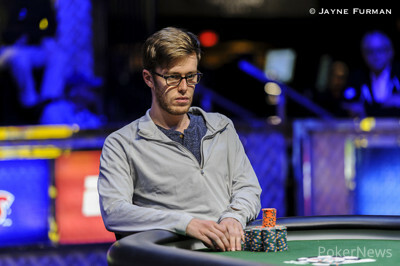 Meanwhile, Kitai joined the likes of Barry Greenstein, Michael Mizrachi, Antonio Esfandiari, and Chip Reese as three-time bracelet winners while also brining his lifetime WSOP earnings up over $1.5 million. Congratulations to Davidi Kitai, winner of Event #15: $3,000 Six-Handed No-Limit Hold’em. Hand #226: Gordon Vayo gave Davidi Kitai a walk in the big blind. Hand #227: Kitai folded his button and Vayo received a walk. Hand #228: Vayo gifted Kitai a walk. Hand #229: Kita moved all-in and Vayo folded. Hand #230: Vayo folded on the button. Hand #231: Kitai moved all in and Vayo called. Kitai showed and Vayo the dominated . Kitai left the table and went to stand with his friends on the rail. Vayo remained at the table with his hands behind his head. The flop kept Kitai’s hand ahead and actually gave him extra outs to a straight. The on the run changed nothing and the on the river secured the win for Kitai who now has three World Series of Poker bracelets to his name and is the first non-American winner of a bracelet at the 2014 WSOP. Hand #223: Davidi Kitai limped the button and then folded when Gordon Vayo raises to 370,000. Hand #224: Gordon Vayo raised to 260,000 on the button and Davidi Kitai folded. Hand #225: Davidi Kitai called on the button, Gordon Vayo checked his option, and the flop came down . Vayo checked, Kitai bet 140,000, and Vayo called to see the turn. Vayo checked, Kitai bet 280,000, and Vayo called. When the completed the board on the river, Vayo checked for a third time and Kitai bet a hefty 775,000. Vayo thought for a bit before calling, but mucked when Kitai tabled the for a straight to the six. 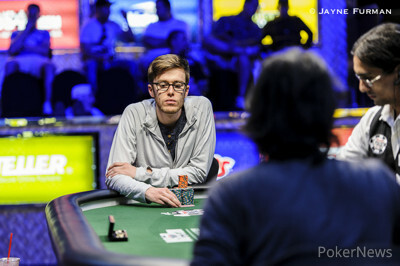 Hand #220: Gordon Vayo called on the button, David Kitai moved all-in and Vayo folded. Hand #221: Vayo received a walk. Hand #222: Vayo moved all-in and Kitai called to put Vayo at risk. Kitai flipped over and was ahead of Vayo’s , but only as long as the flop. The gave Vayo a flush draw to go with his pair of sixes and meant that Kitai could not hit the or otherwise Vayo would still win. The river was the and Vayo doubled up. Hand #215: After Davidi Kitai limped, Gordon Vayo raised to 260,000 but folded when Kitai moved all in. Hand #216: Gordon Vayo limped from the small blind and Davidi Kitai checked his option to see a flop. Kitai bet 140,000, Vayo called, and the appeared on the turn. Kitai bet 255,000, and Vayo responded with a call. When the completed the board on the river, Kitai thought for a bit before sliding out a bet of 575,000 and Vayo snap-folded. Hand #217: Davidi Kitai moved all in and Gordon Vayo folded. Hand #218: Gordon Vayo folded and Davidi Kitai received a walk. Hand #219: Davidi Kitai moved all in and Gordon Vayo folded. Hand #207: Gordon Vayo, fresh from doubling up with pocket aces, called from the button, Davidi Kitai set him all in and Vayo folded. Hand #208: Kitai gave Vayo a walk. Hand #209: Vayo folded and Kitai received a walk and free chips. Hand #210: Kitai called on the button and Vayo moved all-in. Kitai folded and its onto the next hand. Hand #211: Vayo limped in from the button, Kitai checked and the dealer fanned out the flop. Both players checked, the dealer placed the onto the turn and Kitai led for 180,000 and Vayo called. The completed the board, Kitai bet 450,000 and Vayo quickly called. Vayo flipped over and Kitai said “seven” and mucked his hand. Hand #212: Kitai called from the big blind / button and Vayo cheked. The flop came into view, Vayo checked, Kitai bet 130,000 and Vayo called. The was the turn card and both players checed. A on the river was met with a check from Vayo, a 350,000 bet from Kitai and a fold from Vayo. Hand #213: Vayo raised to 260,000 and it was enough to win the pot. Hand #214: Kitai completed on the button, Vayo checked and the flop came , Vayo checked, Kitai bet and Vayo folded. Hand #206: "I Swear to God I Only Looked at One"
Hand #206: Davidi Kitai moved all in from the button and Gordon Vayo looked at one card and called off for 880,000. "I swear to god I only looked at one," Vayo said in shock when he turned over his mystery card to reveal pocket aces. Vayo was in a dominating position, but his confidence disappeared when the flop delivered the ultimate sweat as Kitai picked up the nut flush draw. The crowd was on its feet and held their collective breath as the dealer burned and turned the . Vayo successfully dodged a heart, but he had to do it one more time to stay alive. The river was red, but fortunately for Vayo it was the safe and he was awarded the double. Hand #196: Gordon Vayo folded the button and Davidi Kitai helped himself to some free chips. Hand #197: Kitai moved all-in from the button and Vayo relinquished his hand. Hand #198: Vayo raised all-in and Kitai folded. Hand #199: Kitai raised all in and Vayo mucked his hand. Hand #201: Vayo gave Kitai a walk. Hand #202: Kitai gave Vayo a walk. Hand #203: Vayo moved all in and Kitai let his hand go. Hand #204: Kitai gave Vayo a walk. Hand #205: Vayo called on the button, Kitai took a look at his hole cards and checked from the big blind. The flop was checked by Kitai, Vayo bet 130,000 and Kitai called. The turn was the and both players checked. The completed the board, Kitai bet 120,000 on the river and Vayo raised to 335,000. Kitai moved all-in and Vayo went into the tank for more than three minutes before folding. 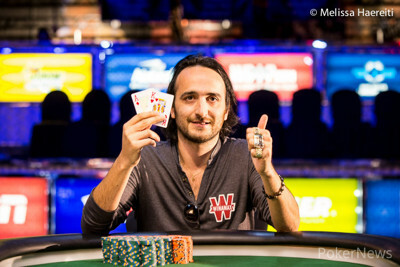 Davidi Kitai - Event 15 Champion!